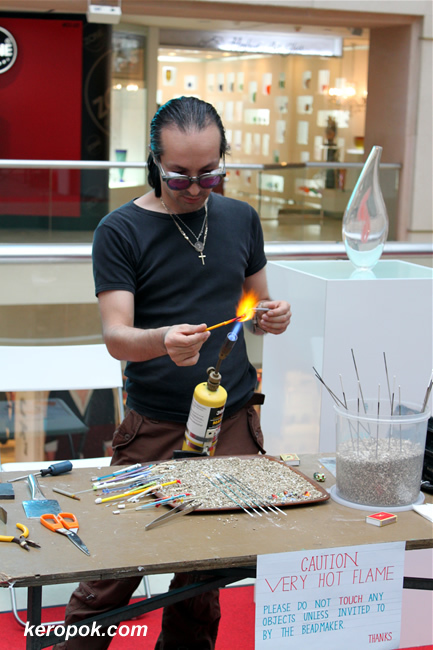 I was quite intrigue by the beadmaker torching glass to melt it and make it into beads. Standing beside him, all of us can really feel the heat from the blow torch. There was a sheet of paper to put down our contact details for more info, but I forgot to fill it up. Oh yes, the above demo was part of the Singapore Art Show demo at Raffles City SC last weekend. Nice with the warning sign! Very interesting. I'm showing some glass art today. It's always nice to watch artist at work ya? oh, i've always wanted to see how it was made...^-^ glad you could take a peek. It seems that they had free lessons too. But like I said, I forgot to fill up the form. You wanna go learn how to make it?